A Southern California-native, Mate Borgogno started his collegiate career far from home, in Nebraska, with the idea being Borgogno starting, The Los Angeles Times wrote. Borgogno played a year, and did well, but he soon returned to California and Cal State Fullerton. The reasoning was simple, Borgogno told The Times in May 1990. "Scouts don't see you play every day in the Midwest," Borgogno told The Times, "and I'm the kind of guy you need to see every day, because I'm not a big, strong, first-round type." The scouts did get a look at Borgogno, enough for him to get selected in the next month's draft. For Borgogno, though, those looks didn't result in a long professional career. His career lasted just two seasons, never making it above single-A. Borgogno's pro career began that year, taken by the Giants in the 18th round of the draft out of Fullerton. Borgogno went to Nebraska and Fullerton out of Nogales High in California. As a 17-year-old there, Borgogno earned mention among the top 25 high school players in the country by Collegiate Baseball magazine, The Times wrote. "Mate is your typical ballplayer. His life revolves around the game," Borgogno's Nogales coach John Romano told The Times in 1987, talking up the young infielder. "And because he's so talented, he does come across as cocky, but it's not intentional. It's a little out of shyness. He's a nice person." With the Giants, Borgogno started at short-season Everett, getting into 31 games there, hitting just .198. He also got 10 games up at single-A Clinton, getting three hits in 25 at bats. Borgogno returned to Clinton for 1991, hitting .226 in 36 games. Those games were his last games as a pro. 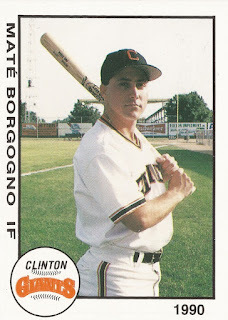 His pro time was also marked by misspellings of his name, spelled Matt Borgogno and Mate Borgono. Borgogno went on to stay in baseball, becoming a coach in high school at La Habra High in California. Along the way, Borgogno's teams won four league championships. He stayed on there until 2008, leaving to spend more time with his family. During his time as coach, it was Borgogno who was talking up his own players. One such player, Kyle Ballard, Borgogno credited with helping the team go 65-25, the team winning two of those league titles, according to The Times. "That's just a huge turnaround," Borgogno told The Times. "I would say a large portion of it is attributable to him."